This UPDATE fixes collision box errors. Chassis: 7 chassis 4x2, 6x2, 6x2 taglift 6x4, 6x4 taglift, 8x4, 8x4 taglift. Boxes: 5 different cargo boxes. 2 axle Coolliner, 3 axle Coolliner, 4 axle Coolliner. 2 axle curtain with straps (Profiliner). 2 axle Painted and Chrome Cistern trailer. Extra Stuff: Cabin, Sideskirts and exhaust pipes up behind cabin. This mod work together with almost all mods out there. But some other truck mods could cause problems. Compatible with ETS2 v1.14.x and all versions after that. NEEDS minimum v1.14.x. 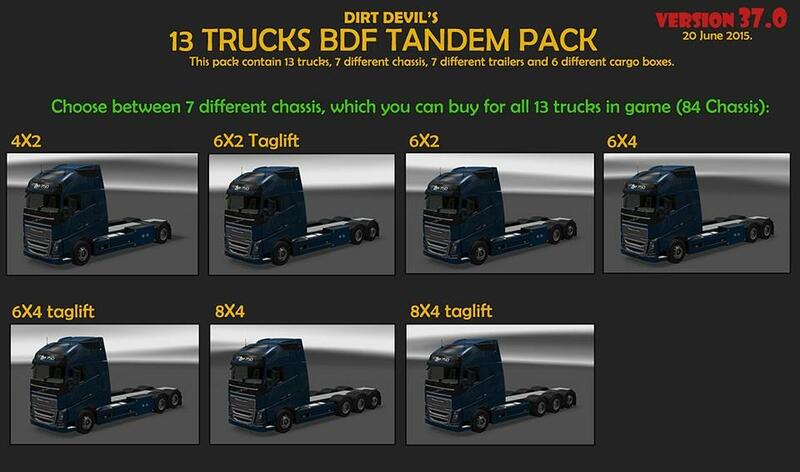 This is 13 standalone trucks with trailer (BDF tandem) and tandem cargo to haul. To drive these trucks you need to go to your favorite truck dealer and upgrade a truck. Select Chassis 4x2, 6x2, 6x4 or 8x4 Tandem and select the dot just behind cabin to add the cargo box. Just overwrite all these devil.dds files with your own colors and your are good to go. White SKIN pack for all cargo boxes and all tandem trailers can be downloaded here. 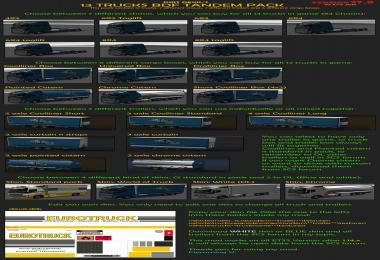 World of Truck SKIN pack for all cargo boxes and all tandem trailers can be downloaded here. Black SKIN pack for all cargo boxes and all tandem trailers can be downloaded here. If you want to drive with Profiliner box and want all trailers to be Profiliners as well then download this mod here and activate it. If you want to drive with Universal box and want all trailers to be Universal as well then download this mod here and activate it. If you want to drive with ALL Trailers in mod, Universal, Profiliner and Coolliner in a mix then download this mod here and activate it. Download All 3 trailers here: All 3 trailers together. If you want to drive with Chrome cistern and want all Painted cistern trailers to be Chrome as well, then download this mod here and activate it. If you want to drive with Painted cistern and want all chrome cistern trailers to be Painted as well, then download this mod here and activate it. If you want to drive with only 4 axle LONG coolliner trailers, then download this mod here and activate it. If you want to drive with only 3 axle coolliner trailers, then download this mod here and activate it. If you want to drive with only 2 axle SHORT coolliner trailers, then download this mod here and activate it. Remember to look for all my other mod as well in this forum. 4. Check the box next to the mod file named "dd_tandem_truck_pack" in the panel on the right hand side of the profile edit screen.